Have you ever eaten a slice of homemade pie and thought to yourself, "This is by far the best pumpkin pie I have ever eaten! What on earth is their secret?!" I know I have. 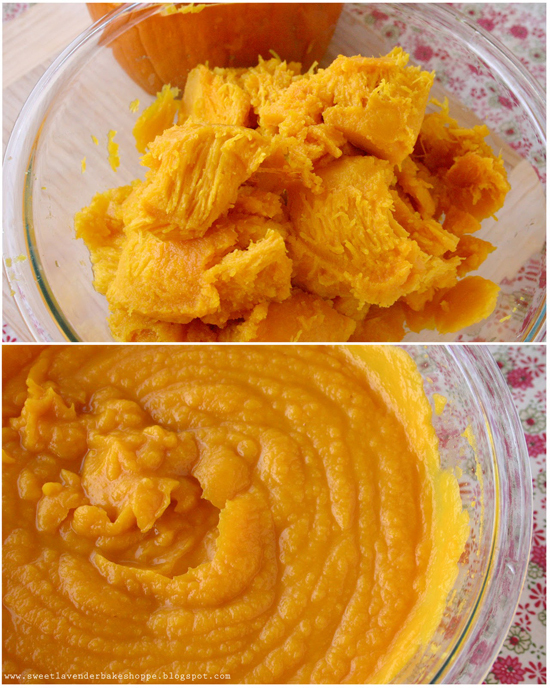 I'm going to go out on a limb and say that now-a-days it might just possibly involve this: homemade pumpkin puree. Pumpkin puree, made from scratch, could possibly be the best thing that ever happened to pumpkin pie. Slow roasted, the flesh becomes ridiculously tender and sweet while the flavors intensify dramatically. Pureed super smooth, this wholesome ingredient packs quite the deep, earthy, pumpkin flavor and texture your pie is desperately asking for. Still following along with Unprocessed October, I decided to ditch the canned stuff (which I will admit was hard to do- ITS SO EASY TO OPEN A CAN!) and make my pumpkin puree needed for a particular recipe from scratch. Scratch. From a pumpkin. One sitting on my table...in all it's small pumpkin glory. Wheeeeeee! The truth? This was easy. Too easy. The kind of easy that makes you think to yourself, "Self! What was my deal before?! What kind of a baking wuss am I?! Why reach for a can of something when I can make an easy 100% preservative/additive free ingredient myself!?" Not to mention an ingredient that tastes and has a texture way better in it's homemade state. I'm all about making desserts taste better. I'm also all about pumpkin pie. So by simple calculations alone this means I am of course completely all about making my pumpkin pie taste as absurdly amazing as I possibly can. Homemade pumpkin puree did that. 2. Wash and dry your sugar pumpkin. Then cut the stem and bottom off. Clean out seeds (and either toss or roast for snacks!). 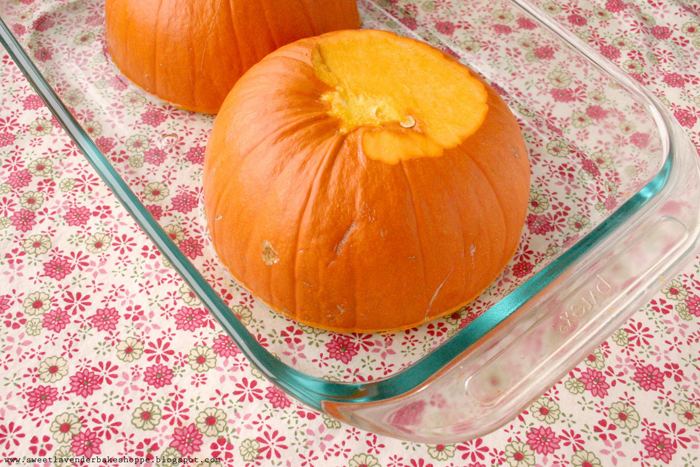 Place cut side down in a 9"x13" glass baking dish and pour water in bottom until it comes up the side of the pumpkin halves by 1/4-1/2". 3. Cover with parchment paper followed by aluminum foil and bake in oven for 50 minutes or until the flesh is completely soft. Take out of oven, uncover and cool 10 minutes. Next take pumpkin (carefully) out of water and dish and place on cutting board to cool completely- about 30 minutes. 4. 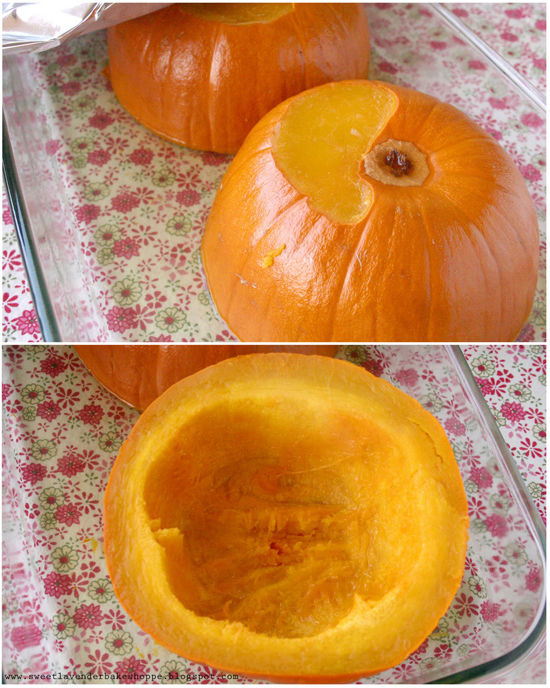 When your pumpkin is cooled completely, carefully remove flesh (without getting any shell) by scraping into a large bowl with a spoon, fork, or better yet- a grapefruit spoon! Next, puree that stuff! You can either use a blender, a hand mixer, food processor- whatever you want- just make sure your pumpkin is pureed into a nice smooth consistency. I used my handy food processor which did the job in about 30 seconds! 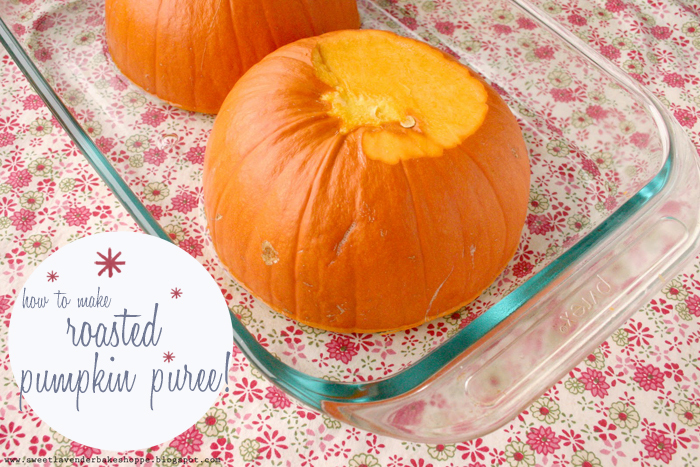 Now you're ready to make that pumpkin pie! **You can use right away. **Place in an air tight container and store in fridge (for up to 3 days). **OR place in a freezer zipper bag portioned out and frozen for up to a month! **Leftovers taste wonderful in a pumpkin cream sauce for pasta, baked into a casserole, or used in any other dessert!